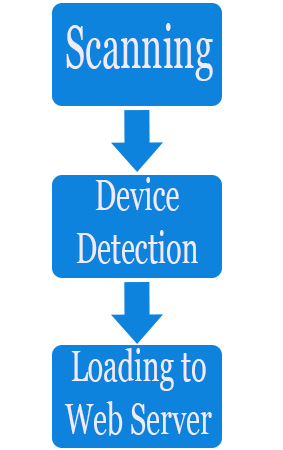 Ibeacon Detection works on Bluetooth Low Energy which is available in Bluetooth 4.0 and later Versions. So for Detection of ibeacon Raspberry pi 3 model is used as its configurations is as per Requirements, having Bluetooth 4.0 and WiFi inbuilt on board. Raspberry pi is programmed to scan all the nearby Bluetooth Devices for about 20 seconds all the detected Bluetooth devices are then sent to server after data manipulation done on the received data from the Command line. The flow of the Program Starts with the Raspberry pi’s Bluetooth scanning process which when completed the Detected Device are then Selected and Manipulated in a more suitable form for uploading to Web server, After That the final stage is then executed device name and MAC address is updated to Web server.